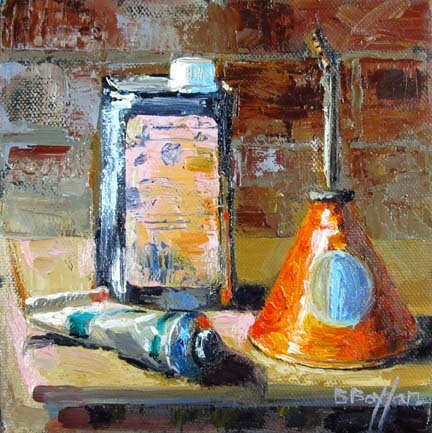 Most of you know Brenda Boylan’s pastel work, but Brenda has been working in oils for the past few years. She has developed her own unique style in this medium and has also been painting city scapes as well as landscapes and still life. 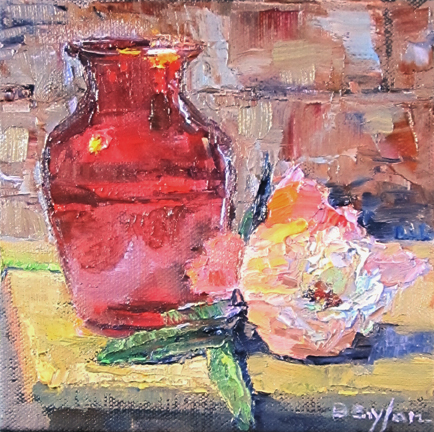 New in the Gallery is a series of 6 x 6 inch still life oil paintings. Her new work is guaranteed to have her signature appeal. Brenda Boylan began her artistic career in California as a graphic designer, working with such notable clients as NIKE and Columbia Sportswear. She is a Signature Member of the Pastel Society of America and the Northwest Pastel Society, and is an award winning and published pastel painter. Boylan is currently featured in the April/May 2012 issue of Plein Air Magazine, where she discusses and demonstrates her unique technique. Boylan has an affinity for painting ‘en plein air’, which she describes as a combination of joy, poetry, and spirituality that uses all her senses to capture the landscape’s beauty. She also enjoys creating studio works when the winter months keep her indoors. She is often inspired by reflection on water, the seasonal color changes in the landscape, and the occasional urban scene. Boylan’s work can also be found in private corporate collections throughout the U.S. She resides in Portland, OR with her husband and two children. Painting is my refuge and my source. It is where I lose myself and find myself, again. As I layer pigment down in the form of pastel or oil, I am transformed to another level of consciousness, much like meditation, where I develop a joyful, poetic conversation with my subject. Each painting measures another step in my journey as an artist that often results in a never ending discovery of my visual world. Working both outdoors and in my studio provides room to communicate color relationships, light, and form. This desire to create and interpret what I see around me is a gift, a treasure, and the road map to my best and truest self. My move into oils has been an expedient one over the course of the year. The oils compliment my pastel work, and on some levels, influencing my technique with pastels, making them loose and more gestural. We are pleased to have artist Lillian Pitt back in the Gallery. Lillian Pitt is a Native American artist from the Big River (Columbia River) region of the Pacific Northwest. Born on the Warm Springs Reservation in Oregon, she is a descendent of Wasco, Yakama, and Warm Springs people. Primarily a sculptor and mixed media artist, Lillian’s lifetime of works include artistic expressions in clay, bronze, wearable art, prints, and most recently, glass. The focus of her work draws on over 12,000 years of Native American history and tradition of the Columbia River region. Regardless of the medium she chooses to use, Lillian’s contemporary works are all aimed at giving voice to her people. “Everything I do, regardless of the medium, is directly related to honoring my ancestors and giving voice to the people, the environment and the animals. 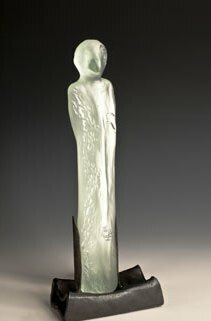 It’s all about maintaining a link with tradition, and about honoring the many contributions my ancestors have made to this world.” While glass is her most recent medium, Lillian continues to create works in all of the various media she is known for, including clay, bronze, jewelry, prints, and mixed media. 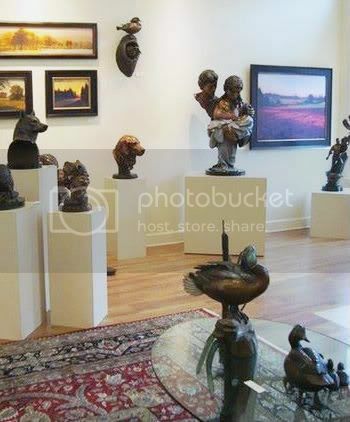 Lillian’s works are found in personal collections, art galleries and museums. They are also found in numerous public spaces including parks, schools and cultural institutions throughout the region. Her most recent public works are featured at the Vancouver Land Bridge, one of the seven “confluence” projects along the Columbia River, designed by internationally renowned architect Maya Lin. Just as her ancestors would have done, Lillian makes creative use of whatever materials are available and appropriate to the task at hand. 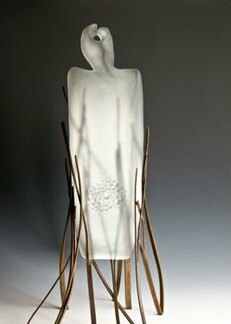 Lillian’s most recent works are made from the mediums of cast glass and fused glass. Lillian will be present at our next First Friday on December 6, 2013. Take advantage of this special opportunity to meet this unique artist and learn about her work and technique. 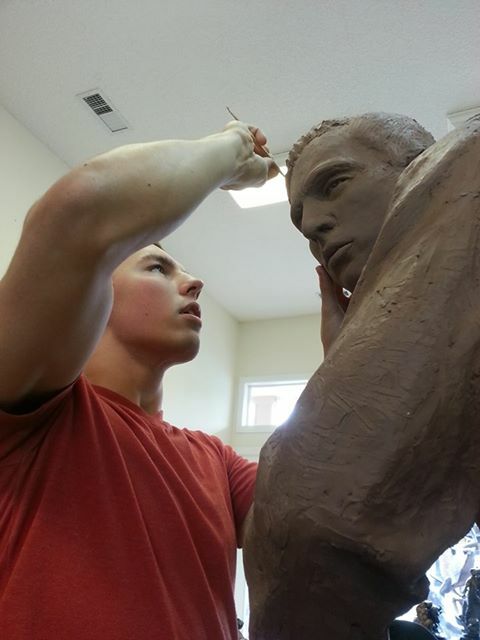 Chad Caswell is well on his way to becoming a respected sculptor in his own right. Chad was contacted by the City of McMinville after seeing the article about him in the Battleground, WA newspaper, “The Reflector“. At the time, the city was assembling a team to commission a monument honoring Leonard DeWitt and all the Oregon Army National Guard soldiers that fought in WWII, who “distinguished themselves in battle”, but were never awarded the Medal of Honor. Despite the nomination by his commanders, it is thought General Douglas MacArthur denied the nomination because DeWitt was not enlisted. The story behind DeWitt’s earning of the nomination for this esteemed medal is dramatic and colorful. DeWitt was stationed in New Guinea, as a Communications Officer in the 41st Division of the U.S. Army. Working in the center of the camp when the first explosion was heard, DeWitt ran over to the battle location to help fight off the attackers, but found himself quite alone. Understanding that the Japanese Commander was ordering his troops to gather at the base of the hill in order to fire at the Americans, DeWitt found a Tommy Gun and a Browning Automatic Rifle and began firing at the Japanese. After shooting into the darkness and using all his ammunition, DeWitt was left with 2 grenades, which he strategically flung into the hole. Unfortunately, in an attempt to avoid a reciprocal grenade, De Witt accidentally lost his balance and slid down the hill, landing between 2 Japanese soldiers. 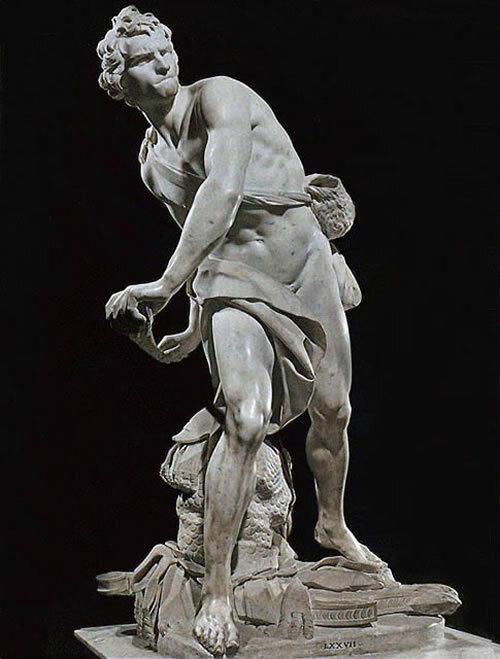 With the only weapon he had–a bayonet used to open rations, he stabbed one of the soldiers. Left with only his helmet, DeWitt managed to finish off the second soldier with a mighty blow. In an act of frustration that the American troops of mainly new recruits had left him on his own, DeWitt threw his helmet into the hole, scaring the remaining Japanese and sending them running. DeWitt suspects they mistook his helmet for a “satchel charge” and retreated. DeWitt did receive the Distinguished Service Cross. This is the Army’s second highest honor (after the Medal of Honor), and is awarded to U.S. and Foreign military personnel and civilians who have displayed extraordinary heroism while engaged in action against an enemy of the United States, in military operations involving conflict with a foreign force, or while serving with a friendly nation engaged in armed conflict against a force in which the United States is not a belligerent party. Oregon National Guard historian Lt. Col. Alisha Hamel, is assisting DeWitt with a new nomination for the Medal of Honor. The new nomination was submitted to Senator Jeff Merkley’s office, who then forwarded it to the Secretary of the Army for vetting. 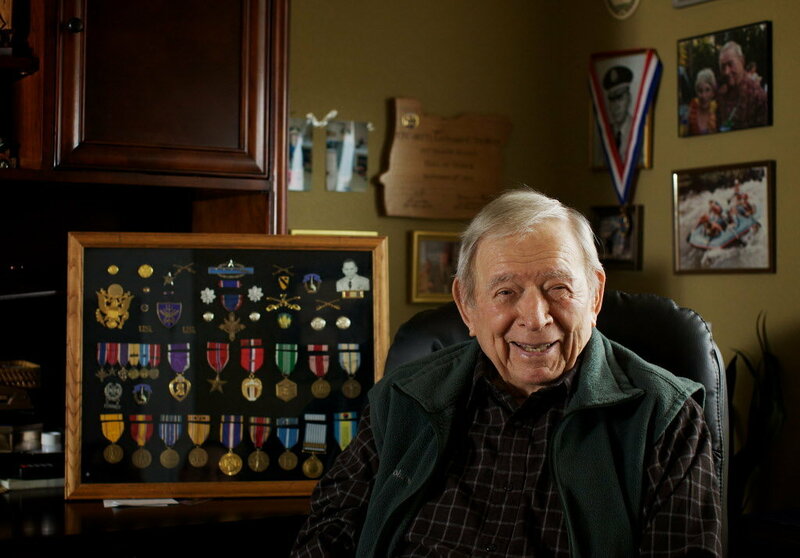 State Representative, Jim Weidner is spearheading the effort to honor Leonard DeWitt and all the Oregonian reservists just like him, with a monument to their service and heroism. When Representative Weidener realized that Leonard is in his district, he got a bill (HJM17) through the Oregon Legislature, asking Congress and the President to request this Medal on Leonard’s behalf. Senator Ron Wyden proclaimed that he, Governor Kitzhaber and Senator Merkeley were going to do all they can to push this through Congress. Chad had the honor of meeting Leonard DeWitt and his wife, Joanne, along with Representative Weidner at the State Capitol in Salem. At that time DeWitt and his wife expressed their delight that the monument will be created. The sculpture will be installed outside, in McMinville’s city square. DeWitt is 91 and live with his wife in McMinville, OR. To learn more a out the Congressional Medal of Honor, visit wwwcmohs.org.